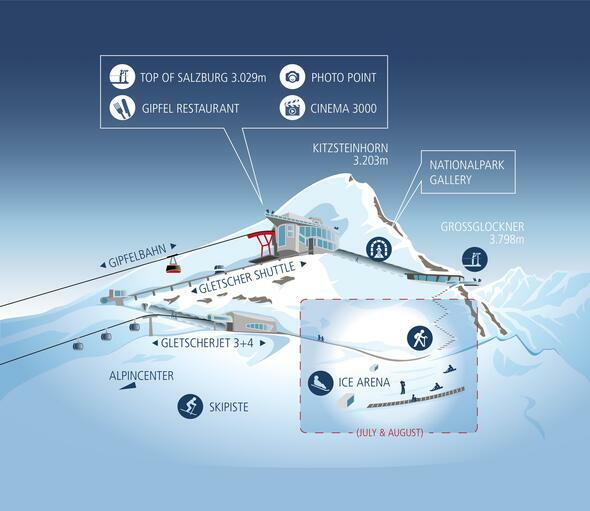 Dine at the highest level at the Gipfel Restaurant of the Kitzsteinhorn in 3.029 metres above sea level. And you couldn't go any higher because here you enjoy regional delicacies and international classics at the highest-situated restaurant in Salzburger Land. Take a seat in front of the large panorama windows in the self-service area or the “Schmittenblick” restaurant (table-service in winter) and enjoy being treated to culinary delights in a stylish ambience in front of the stunning scenery of the surrounding three thousand metres high mountains. The modern facility in alpine style harmonically reflects the elements snow, ice and blue sky. As awarding-winning establishment of the "Via Culinaria - Genussweg für Hüttenhocker“ in Salzburger Land, the Gipfel Restaurant puts great emphasis on top quality. Refining regional products and turning them into a culinary highlight, the kitchen team creates a new special "Via Culinaria“ dish every year. Are you looking for an event location for your convention, workshop or company dinner? We will be delighted to send you an individual offer. Please send your enquiry to office@kitzsteinhorn.at.